William Von Mueffling's 13F portfolio value decreased this quarter from $8.89B to $8.29B. VeriSign and Thermo Fisher Scientific stakes were increased, while reducing Baidu and adding Moody’s. The portfolio continues to be very concentrated, with the top five positions accounting for ~28% of the 13F portfolio. 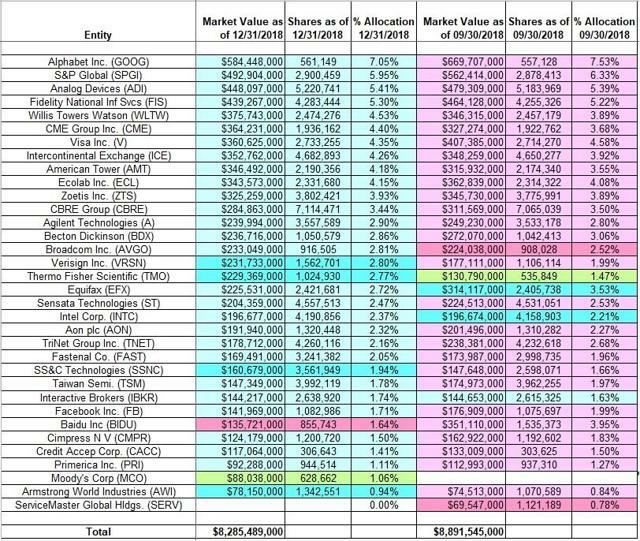 This article is part of a series that provides an ongoing analysis of the changes made to William Von Mueffling’s 13F stock portfolio on a quarterly basis. It is based on Mueffling’s regulatory 13F Form filed on 02/05/2019. Please visit our Tracking William Von Mueffling's Cantillon Capital Management Portfolio series to get an idea of his investment philosophy and our previous update for the fund’s moves during Q3 2018. This quarter, Mueffling’s 13F portfolio value decreased ~7%, from $8.89B to $8.29B. The number of holdings remained steady at 33. The portfolio continues to be heavily concentrated, with the top five positions representing ~28% of the total 13F holdings. The largest stake is Alphabet Inc. (GOOG, GOOGL), which accounts for ~7% of the portfolio. The largest five positions are Alphabet Inc., S&P Global (SPGI), Analog Devices (ADI), Fidelity National Information Services (FIS), and Willis Towers Watson (WLTW). Moody’s Corp. (MCO): MCO is a small ~1% portfolio stake established this quarter at prices between $129 and $170, and the stock currently trades at $162. ServiceMaster Global Holdings (SERV): SERV was a medium-sized 3.76% position as of Q2 2018. It was purchased in Q1 2016 at prices between $35 and $42.50, and increased by ~55% over the next three quarters at prices between $32.50 and $41.50. The last six quarters through Q2 2018 saw a ~17% reduction at prices between $36.50 and $59.50, and that was followed with a ~80% selling last quarter at prices between $38 and $42. The disposal this quarter was at prices between $34.25 and $45.50. The stock is now at $39.22. Note: ServiceMaster was taken private in 2007 in a private equity transaction. In June 2014, it had an IPO at $17 per share. VeriSign Inc. (VRSN): The 2.80% VRSN position saw a ~40% increase this quarter at prices between $134 and $165. The original stake is from Q3 2017 at prices between $93 and $106. The stock currently trades well above those ranges at ~$174. Thermo Fisher Scientific (TMO): TMO is a small new ~1.5% of the portfolio position established last quarter at prices between $206 and $249, and increased by ~90% this quarter at prices between $208 and $252. The stock currently trades at $247. SS&C Technologies (SSNC): SSNC is a 1.94% of the portfolio position built in H2 2016 at prices between $28.50 and $33.50. Q1 2018 saw a ~75% stake increase at prices between $40.50 and $53.50, and that was followed with a ~37% increase this quarter at prices between $41.50 and $56. It is now at $52.26. Alphabet Inc.: GOOG is Mueffling’s largest position at ~7% of the portfolio. The original stake was established in 2010 and doubled in 2011 at much lower prices. The last significant buying happened in Q2 2014, when the position was increased by ~14% at prices between $510 and $580. The two years through Q3 2018 had seen a combined one-third reduction at prices between $755 and $1270. The stock currently trades at $1115. Mueffling is harvesting huge long-term gains. This quarter saw a marginal increase. S&P Global (previously McGraw Hill Financial): The top-three ~6% SPGI stake was established in Q1 2015 at prices between $86 and $109. Q3 2015 saw a huge ~140% increase at prices between $85 and $107, and that was followed with another ~75% increase next quarter at prices between $87 and $100. There was a further ~20% stake increase in Q1 2016 at prices between $81 and $100. The stock currently trades at ~$193. The nine quarters through Q3 2018 had seen a combined ~25% reduction at prices between $110 and $215. There was a marginal increase this quarter. Analog Devices: ADI is a long-term stake that has been in the portfolio since 2010. At the time, it accounted for just over 10% of the portfolio. The position was increased by two-thirds in 2011 as well. The last major buying was in Q4 2014, when the stake saw a ~20% increase at prices between $43 and $58. The stock currently trades at $102. It is Mueffling’s third-largest position at 5.41% of the portfolio. The last six quarters had seen a ~22% selling at prices between $76 and $102, while this quarter there was a marginal increase. Fidelity National Information Services: FIS was a minutely small position in Q1 2013. The following quarter saw the stake increased to a large ~6% position at prices between $39 and $46. Q3 2013 saw a 15% increase at prices between $43 and $48, and the following quarter saw another 44% increase at prices between $49 and $57. The stock currently trades well above those ranges at ~$110. The last two years had seen a ~43% reduction at prices between $74 and $110, while this quarter saw a marginal increase. It is Mueffling’s fourth-largest position at 5.30% of the 13F portfolio. Willis Towers Watson plc: The 4.53% stake came about as a result of the merger between Willis Group Holdings and Towers Watson that closed on January 6, 2016. Cantillon’s large stake in Willis Group Holdings was converted to WLTW shares. There was a ~12% increase in Q3 2016 at prices between $120 and $133. The original position is from Q3 2013, and their overall cost basis is ~$110, compared to the current price of ~$166. There was a ~22% trimming over the last six quarters at prices between $128 and $164, while this quarter there was a marginal increase. CME Group (CME): CME is a 4.40% of the 13F portfolio stake established in Q4 2014 at prices between $78 and $93. Q4 2015 saw a ~60% stake increase at prices between $87 and $100. The stock currently trades well above those ranges at ~$178. The last eleven quarters had seen a combined ~25% selling at prices between $85 and $175, while this quarter saw a marginal increase. Visa Inc. (V): V is a 4.35% stake established in Q4 2015 at prices between $70 and $80. It was increased by ~125% in 2016 at prices between $70 and $83. Q1 2017 saw another ~15% stake increase at prices between $78 and $90. The stock is now well above those ranges at ~$142. There was a ~23% selling over the last six quarters at prices between $89 and $150, while this quarter there was a marginal increase. Intercontinental Exchange (ICE): ICE is a fairly large 4.26% of the portfolio stake established in Q4 2014 at prices between $39 and $45. The following two quarters saw the position almost doubled at prices between $44 and $48. There was another ~17% increase in Q4 2016 at prices between $52.50 and $60. The stock currently trades at $77.39. The last seven quarters saw a combined ~22% selling at prices $57 and $78, while this quarter saw a marginal increase. Note: Prices are adjusted for the 5-for-1 stock-split in October 2016. American Tower (AMT): AMT is a 4.18% position established in Q1 2016 at prices between $84 and $102, and increased by ~50% the following quarter at prices between $103 and $113. There was another ~150% increase in Q4 2016 at prices between $101 and $117. The stock currently trades at $170. The last seven quarters saw a ~22% selling at prices between $104 and $151, while this quarter there was a marginal increase. Ecolab Inc. (ECL): ECL is a 4.15% of the portfolio stake first purchased in 2012. The original position was increased by around 75% in Q1 2013 at prices between $72.50 and $80. Q4 2014 and Q1 2015 saw a combined one-third increase at prices between $99 and $117. The stock currently trades at ~$159. The last six quarters saw a combined ~22% selling at prices between $111 and $160. There was a marginal increase this quarter. Zoetis Inc. (ZTS): The 3.93% ZTS stake was established during Q4 2015 and Q1 2016 at prices between $39 and $48. The next seven quarters had seen an ~18% reduction at prices between $45 and $72, and that was followed with a similar reduction in Q1 2018 at prices between $71 and $85. It currently trades at $87.58. Mueffling is harvesting gains. The last two quarters also saw a combined ~10% trimming. This quarter saw a marginal increase. CBRE Group Inc. (CBRE): The 3.44% stake in CBRE was purchased in Q1 2016 at prices between $23 and $34.50, and increased by ~125% over the next two quarters at prices between $24.50 and $31. The stock is now at $46.28. There was a ~16% selling over the last two years at prices between $26 and $50. This quarter saw a marginal increase. Agilent Inc. (A): Agilent is a 2.90% of the portfolio position established in Q4 2015 at prices between $33.50 and $42.50. Q4 2016 saw a ~17% increase at prices between $43 and $48. The stock currently trades well above those ranges at $76.30. There was a ~15% reduction in Q1 2018 at prices between $65 and $75, and that was followed with a ~10% trimming over the next two quarters. This quarter saw a marginal increase. Beckton Dickinson (BDX): BDX is a 2.86% of the portfolio stake established in Q4 2016 at prices between $163 and $180, and increased by ~30% the following quarter at prices between $165 and $185. The stock is now at $243. There was a ~22% selling over the last six quarters at prices between $166 and $262, while this quarter saw a marginal increase. Broadcom Inc. (AVGO): AVGO is a 2.81% of the portfolio stake established in Q1 2017 at prices between $174 and $227, and increased by ~55% in Q3 2017 at prices between $230 and $257. There was another ~20% stake increase in Q1 2018 at prices between $228 and $273. The stock currently trades at $276. There was a one-third reduction last quarter at prices between $202 and $251. This quarter saw a marginal increase. Equifax (EFX): EFX is a 2.72% of the portfolio stake purchased in Q4 2016 at prices between $112 and $135. H1 2017 saw an ~80% stake increase at prices between $117 and $143, and that was followed with a ~130% increase in Q3 2017 at prices between $93 and $146. The last three quarters through Q2 2018 had seen a combined ~12% trimming, while last quarter saw a ~30% stake increase at prices between $123 and $138. The stock is now well below their purchase price ranges at ~$107. For investors attempting to follow Cantillon, EFX is a good option to consider for further research. This quarter also saw a marginal increase. Sensata Technologies Holding N.V. (ST): ST is a 2.47% of the 13F portfolio position established in Q2 2014 at prices between $44 and $50. The first three quarters of 2015 saw the stake more than doubled at prices between $49 and $59. It currently trades at $48.74. The last seven quarters had seen a ~24% trimming, while this quarter there was a marginal increase. Intel Corp. (INTC): INTC is a 2.37% of the portfolio position established in Q2 2018 at prices between $48.50 and $57 and increased by ~70% last quarter at prices between $45 and $52.50. It is now at $49.90. There was a marginal increase this quarter. For investors attempting to follow Cantillon, INTC is a good option to consider for further research. Aon plc (AON): The 2.32% AON position was increased by ~50% in Q2 2018 at prices between $135 and $145, and the stock is now at $168. Last quarter saw a ~6% trimming, while this quarter there was a marginal increase. TriNet Group Inc. (TNET): The 2.16% of the portfolio stake in TNET was established in Q2 2016, with the bulk purchased in the following two quarters at prices between $18.50 and $26. There was a ~15% increase over the two quarters through Q2 2018, while last quarter saw a ~6% trimming. The stock is now at $46.32. There was a marginal increase this quarter. Note: Cantillon controls ~6% of TriNet Group. Fastenal (FAST) and Armstrong World Industries (AWI): These two positions established in Q2 2018 were increased this quarter. The ~2% FAST stake was purchased at prices between $48 and $56, and increased by ~8% this quarter at prices between $48.50 and $60. The stock currently trades at $61.52. The very small 0.94% AWI stake was purchased at prices between $55 and $65, and it currently goes for $67.92. This quarter saw a marginal increase. Taiwan Semiconductor (TSM): The 1.78% TSM stake was established in Q3 2017 at prices between $34.50 and $38.50. The position saw an almost two-thirds increase in Q1 2018 at prices between $40 and $46.50. It is now at $38.74. The last two quarters saw a combined ~10% trimming, while this quarter saw a marginal increase. Interactive Brokers Group Inc. (IBKR): IBKR is a small 1.74% of the portfolio stake established in Q2 2017 at prices between $34 and $38, and increased by ~11% the following quarter. There was another ~25% increase in Q1 2018 at prices between $59 and $74. The stock currently trades at $50.81. There was a ~3% trimming in Q2 2018, while last quarter saw a ~6% increase. There was a marginal increase this quarter. Facebook Inc. (FB): FB is a 1.71% of the portfolio stake established in Q1 2018 at prices between $152 and $193, and increased by ~60% next quarter at prices between $155 and $202. The stock is currently at ~$171. There was a ~6% trimming last quarter and a marginal increase this quarter. Cimpress NV (CMPR): CMPR is a 1.50% of the portfolio position first purchased in Q3 2014. The bulk of the current stake was purchased the following quarter at prices between $54 and $76, and the stock is now at $79.59. The last nine quarters had seen a combined ~25% selling at prices between $83 and $171. There was a marginal increase this quarter. Note: Cantillon controls ~4% of Cimpress. Credit Acceptance Corporation (CACC) and Primerica, Inc. (PRI): These two small stakes (less than ~1.5% of the portfolio each) saw marginal increases this quarter. Baidu Inc. (BIDU): BIDU is a 1.64% portfolio stake first purchased in 2012. The original position was increased by over 30% in Q1 2013 at prices between $84 and $113, and another 30% in the following quarter at prices between $83 and $103. The stock currently trades at ~$174. The last two years saw a combined ~18% selling, and that was followed with a ~45% reduction this quarter at prices between $155 and $227. Mueffling is harvesting gains. Disclosure: I am/we are long INTC. I wrote this article myself, and it expresses my own opinions. I am not receiving compensation for it (other than from Seeking Alpha). I have no business relationship with any company whose stock is mentioned in this article.